Frittatas are basically open faced omelets or like an egg pizza. Eat them for breakfast, lunch, or dinner….quick and easy. Swap up the fillings for whatever you have on hand or whatever is in season at your local farmer’s market. I will throw just about anything and everything except the kitchen sink in a frittata (hence the name). And like anything else….top with a good parmesan cheese or even goat cheese. I’m talking real cheese here people…put away those slices of american cheese. 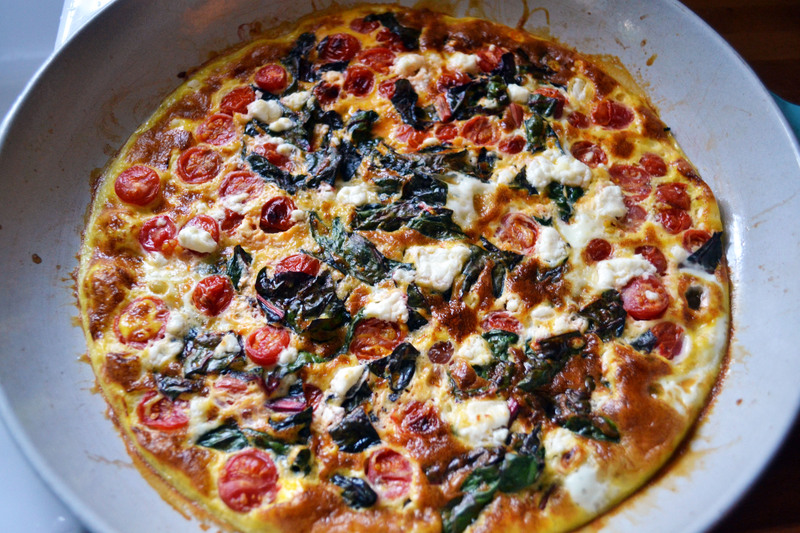 For this frittata, I added the last of the cherry tomatoes and some ruby swiss chard from my garden. I finally beat the squirrels and was able to enjoy a few succulent tomatoes!!! Ha! I think their stomachs are currently bloated from devouring the pumpkins that were on my porch. My front porch looks like a pumpkin massacre. I give up. I do have a boat load of swiss chard in my garden right now. The market is busting with them too. If you have never given chard a try, you should venture out and give it a shot. Swiss chard is a hearty winter green that I love to throw into stews, saute as a side dish, or use as a bed for poached eggs. Any recipe that you would put cooked spinach in, you could use swiss chard. It requires a bit more cook time than spinach because it is slightly tougher. Similarly, if you don’t have swiss chard, swap in spinach. Preheat broiler. Set top rack just beneath broiler. Heat an 8 to 10-inch ovenproof skillet over medium-high heat. Heat olive oil. Add tomatoes and swiss chard and saute for 5 minutes, stirring often. In a medium bowl, whisk eggs and salt and pepper. Add eggs and half of cheese to skillet. Reduce heat to medium. Stir to blend the eggs, chard, and tomatoes. Cover and cook eggs until almost set, about 5 minutes. Sprinkle with remaining cheese. Transfer skillet to oven. Broil until just set in the center and cheese is slightly browned. Do not over cook! Remove from oven. Using a rubber spatula, loosen edges of frittata from skillet. Place a large plate or serving platter over the skillet. Flip skillet and platter over so that the frittata falls onto the plate. Cut into six pieces and serve. 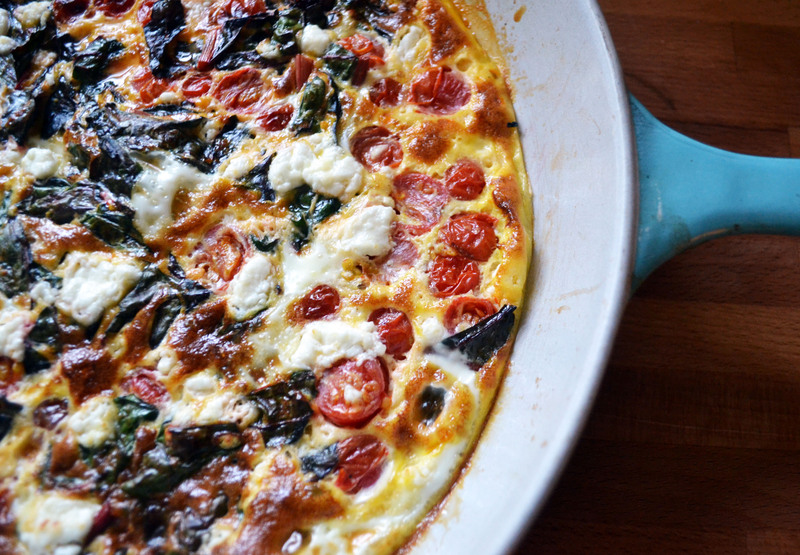 I’ve always been scared of frittatas but it seems easy enough… and healthy!